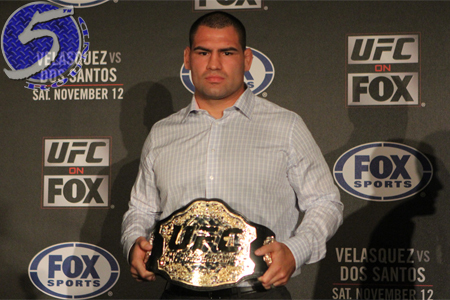 See that bling-bling Cain Velasquez is holding in the picture above? That’s the real UFC heavyweight championship belt. His hardware. Please don’t mistake it for the interim one that either Fabricio Werdum or Mark Hunt will be donning after UFC 180. Although a 265-pound title belt will be on the line in Saturday’s main event, Velasquez believes it’s a manufactured strap that merely adds significance to the fight. Werdum vs. Hunt is a tough sell at $54.95, but put gold on the line and perhaps fans will be more inclined to buy the pay-per-view. “It’s the interim belt,” Velasquez said Thursday to a group of reporters in Mexico City. “It’s the interim belt. We’re going to fight for, I guess, ‘the real one’ coming up when I fight. So I don’t think too much into it. When I have my chance to fight, we’ll fight for the real one. Without question, when Velasquez is healthy he’s the division’s baddest mofo. The problem is, he’s seemingly injured more than not since initially capturing the crown in October 2010. The 32-year-old has only fought six times since blasting Brock Lesnar due to various injuries. UFC president Dana White said Thursday that he’d consider stripping Velasquez of his belt if he can’t return by March, most likely for a title unification bout against Saturday’s victor. Velasquez hasn’t been seen since steamrolling Junior dos Santos for the second time in October 2013.